The Metropolitan Youth Symphony is a Portland institution. Founded by Lajos Balogh in 1974, it gives young people the opportunity to play and perform in band and orchestra settings beyond the typical high school milieu. MYS incorporates 438 local students in 13 ensembles in 11 yearly concerts. On June 9, the MYS gave its spring concert, "Finale", at Arlene Schnitzer Concert Hall, in which the Jazz Band I, the Concert Orchestra and the Symphony Orchestra presented their offerings in fine form. Derek Sims conducted Jazz Band I, Ken Selden conducted the Concert Orchestra, and Andres Lopera, Balogh's successor, conducted the Symphony Orchestra. If you happen to live or "vacation" in or around Lake Oswego, as I do, you may have seen the erstwhile director of the Metropolitan Symphony Orchestra and beloved local figure, Lajos Balogh, as I did recently at an art opening. Over cheese and wine, the Maestro with personable blue-grey eyes and bushy Einsteinesque hair may answer questions about how his tenure in Oregon came about (his Hungarian mother preferred that he move to Oregon, where she was, rather than to continue to tour on the east coast as a violinist) how Oregon got its name (German immigrants traveled north from California in search of rain, which reminded them of home, and then exclaimed, 'Oh! Regen!') and which concert repertoire he likes best (rather evenly, as if to preserve the egos of the composers involved, he stated that he likes all of it). Those who have seen Maestro Balogh speed by in his red sports car, bearing the license plate tag, "HAYDN", however, know that he has at least one favorite. Mr. Balogh was present at this concert, and received an ovation at intermission before Andres Lopera took up the baton in conducting the Symphony Orchestra. The concert opened with Jazz Band I, conducted by Derek Sims. "Samba De Rollins" by Don Menza featured the brisk, uptempo drumming of Grace Choi. Randy Brecker's "Some Skunk Funk" followed, with competent solos from each section of the band. "Fingers", a Thad Jones tune, featured a piano and trumpet duet with the pleasant noodling of a muted trumpet contrasting with the crisp piano chording of Justin Salisbury. The trumpet section, the largest in the band, impressed by being in tight ensemble throughout and in good balance with the rest of the group. The Concert Orchestra then took the stage to play the dark, brooding opening of Beethoven's "Overture to Egmont", which was conducted both defiantly and lyrically in proper Beethovenian spirit by Selden, who is also the conductor of the PSU Symphony. The final section was particularly well done, with an accelerando and crescendo that were truly exciting. The sole trumpet of the orchestra, Nolan Sester, was notable in this piece for his good intonation and phrasing. Faure's prelude to the "Peleas et Melisande Suite" followed. This selection appeared to be a favorite of the orchestra, especially of the strings, who seemed to fall into the lush string writing with pleasure. The opening phrases were warmly and expressively played. The highlighted woodwind section gelled during the Faure. The Haydn Presto is from Symphony No. 100, Haydn's "Military" symphony, which features the so-called "Turkish" instruments of the day, such as timpani and triangle. It opened with crisply articulated and bouyant phrasing and continued with good dynamic contrast throughout. After this bout of Haydn's typically rhythmic and good-natured tomfoolery, the audience repaired to the Schnitzer lobby in a fine mood to cogitate and imbibe before the second part of the program. After the intermission, the Symphony Orchestra assembled on stage and Andres Lopera, introducing himself as Balogh's successor, took the baton. Lopera, originally from Columbia, studied at the University of Texas and New England Conservatory. He is finishing his first year at MYS. Lopera's conducting is precise and energetic, and the orchestra responded in kind to his direction. During Brahm's ''Academic Festival Overture,'' a brooding motive in the strings is gradually joined by brass and woodwinds. The piece contains long string sections of both lyricism and profundity, jettisoned by sprightly rhythmic upsurges. The bassoons and oboes charmed in their delivery of this rhythmic motive before it repeated in other sections. (Brahms seemed to like the triangle, perhaps as an homage to Hadyn, and puts plenty of it in the impressive crescendo at the end.) It's a heavy offering, which, like much of Brahms, must be carried like a large piece of furniture in danger of bumping into corners. The Symphony Orchestra handled it well. The opening of Dvorak's Symphony No. 8 was conducted with great expression by Lopera. The orchestra was at its best in this symphony. The strings at times achieved a near-professional sound, with an impressive warmth and dynamic range displayed in the lyrical passages of the Allegretto. Uncommonly sensitive playing was produced throughout by a young bespectacled bassist. The entire cello section tackled its several unison themes savagely, deeply, and soulfully as required in the various movements. There was lovely phrasing of the flute solos which alternate in question and answer phrasing with the orchestra. The finale of "Finale" was a piece written by the pianist Michael Allen Harrison, entitled "Samba." Harrison, attired in a melon green shirt and sporting a suave grey halo of hair, ambled onto the stage to introduce it. He wrote this piece in the 90's to spotlight his drummer, Israel Annoh. Harrison and Annoh started out the samba, and were joined by the orchestra and jazz band. Lopera invited the audience to dance before this piece, and indeed, this frothy tune with its sweeping string phrasing put me in mind of dancing on the Love Boat with Lucy and Desi Arnaz, and perhaps the Skipper and Marianne, too. The piano, drums, jazz band and orchestra were suprisingly well blended, and this piece ended the evening on a a spicy up-note. Tri-Met bus riders informally polled (OK, they were just spontaneously gushing) after the concert were definitely satisfied. Chamber Music Northwest's 43rd annual Summer Festival kicked off at Kaul Auditorium on the Reed College campus at 8pm on Monday, June 24th. Longtime executive director Linda Magee stepped down after 33 years, and interim executive director Elizabeth Harcombe gave the opening remarks. The evening featured three works for piano, cello and clarinet, with Wu Han, David Finckel, and CMNW stalwart David Shifrin playing those instruments, respectively. The night began with Beethoven's Trio in B-Flat Major, Op. 11. An early work, it was very straightforward and delightful to hear. Finckel appeared to be having a lark--playing much of the opening movement in a spritely saltando with an infectious giddiness that did nothing to overshadow Han's dazzling fireworks on the piano, betraying deft melodic sensibility. Shifrin's playing was sometimes overpowering in the opening movements, but by the third movement, a sort of scherzo that featured a delightful fughetta, all players found the proper alignment; all in all this work was great fun and a nice way to open the festival. Four pieces from Bruch's Eight Pieces for Clarinet, Viola (Cello) and Piano, Op. 83 rounded out the first half. Finckel's touch again seemed to steal the show in the opening Nachtgesang, filling the hall with a dark, glorious cantabile that continued on through the second movement, which was like a somber lied, and the third, an andante con moto wherein the cello ranged from mournful to angry. Shifrin and Finckel seemed to trade arias, a series of contrasting monologues in which the cello kept up its threnody while the clarinet spoke in opposition, providing an emotional counterpoint through brief, poignant moments of hope, almost angelic in quality. The second half was composed entirely of Brahms' Trio in A Minor for Clarinet, Cello and Piano, Op. 114. A stormy opening gave way shortly to contemplative reflection. Finckel never let one phrase pass without investing it fully with meaning from the seemingly bottomless palette at his fingertips, but the ensemble playing was also more deliciously evident in the Brahms from all players. In the second movement this unity of ensemble was especially clear--intimate, unaffected playing, the sort of performance wherein the individual players stand aside and the music is clearly heard. Three superb musicians playing instruments of such different timbres coming together in such a way that it becomes difficult to tell where one instrument stops and another begins--now that is a rare beauty, and the Andantino grazioso provided the framework for that to happen. Gracious indeed; CMNW's Summer Festival should once again provide a month of incredible music if the opening concert is any indication. It's disappointing to learn that the City will not be funding the Oregon Symphony's Waterfront Concert this year. According to the orchestra's press release (below), the popular concert has been axed. However, Sunday's print edition of The Oregonian stated that the budget is not as bad as it had looked (see "A surprise budget reversal in the Metro section). I'm wondering if it will continue to improve through the summer, and that there may still be a chance to have the concert, which was scheduled for August 29th. (PORTLAND, Ore.) – Recent budget cuts mandated by the City and made by the Regional Arts and Culture Council have resulted in the cancellation of this year’s Waterfront Concert. Realizing the importance of this concert to the thousands of Portland residents of all ages, ethnicities, and neighborhoods who attend each year, the Symphony made a last ditch effort to find new sponsors for the popular end-of-summer event. When none could be found, the concert—like so many other worthwhile endeavors whose funding disappeared during these challenging fiscal times—was no longer possible. It is anticipated that this will be a one-year hiatus for the popular event. This year's music critics annual meeting will take place in Boston where the Boston Early Music Festival is underway. About 30 card-carrying members of the Music Critics Association of North America (including yours truly) are in Beantown to indulge in the early music scene here. We've will be hearing a number of concerts and talking with the folks who have made this festival a big success since 1980 (its inaugural year). 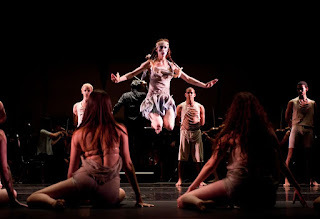 7:00 - OPERA - Handel’s "Almira"
ux Enfers" and "La Couronne de Fleurs"
The Tennessean newspaper has recently pointed out that the Nashville Symphony and its performance space, Schermerhorn Symphony Center, are at the edge of a financial cliff. According to this article, the Bank of America is still owed $82 million for the construction of the concert hall, which was completed in 2006. The Nashville Symphony owns the hall, but has been struggling to make payments, and orchestra reported severely declining revenue for the previous season (ending July 31, 2012). You may be wondering what this has to do with Oregon. For starters, Jun Iwasaki, the concertmaster of the Nashville Symphony, was the former concertmaster of the Oregon Symphony. With a newly built concert hall and recording contracts with Naxos, it was a very smart move for Iwasaki. Also, the music director of the Nashville Symphony is Giancarlo Guerrero. Guerrero is the former MD of the Eugene Symphony. He also made an excellent decision to take the helm in Nashville, where, according to this article, his salary is $471,458 "with additional income of $18,688 from a related organization." In contrast, according to this article in Adaptistration, Carlos Kalmar's income from the Oregon Symphony was $364,200 (2009-2010 season - last public record). Also, there is always talk in Portland about the sonic deficiencies of the Arlene Schnitzer Concert Hall, and that the orchestra needs a new performance space. That is true, but there are a lot of dangers when considering the construction of a new hall, as the folks in Nashville are finding out. Extra note: The musicians of the Nashville Symphony have written a press release about the situation with the Schermerhorn. You can read their statement on Charles Noble's blog here. The Portland Columbia Symphony Orchestra has announced five finalist candidates, who will be vying to become the orchestra's next Music Director (Huw Edwards resigned from the position in 2011). 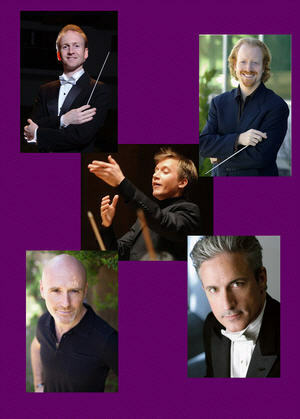 Each candidate will conduct concerts in the 2013-2014 season. 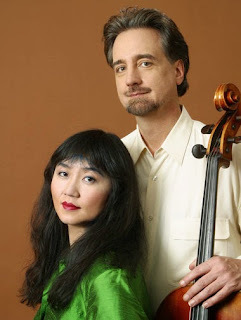 Peter Shannon (May 2 and 4, 2014) with soloists Oregon Symphony Concertmaster Sarah Kwak and her husband Vali Phillips. The orchestra received 151 applications last fall and a search committee composed of players and board members narrowed the field to a short list of ten in May.